At present, this page describes two different woodlands within the Parish of Barrow. Firstly, please read the article about “NABS” wood, then scroll down for details of Ferma Wood. NABS WOOD is a plantation in the Parish of Barrow only just over half a mile from the centre of Great Barrow. Starting at the White Horse Inn, go down Main Street reaching the Barrow Village Hall in 100 yards on your right. The road sweeps round a big left hand curve into Village Road which is not named at this point. In about a quarter of a mile the road reaches a triangular junction and sweeps round to the right into Heath Lane. It goes past Manor Park on the right and in about half a mile reaches Hollowmoor Heath, a lane on the left. Follow the lane to a T junction and turn left into Irons Lane. The lane immediately passes the Barrow Community Social Club on the left and in another 100 yards the gate into the plantation is on the right hand side. NABS WOOD is privately owned by Tim Healey, but a notice on the side gate welcomes people to walk into the wood for recreation. 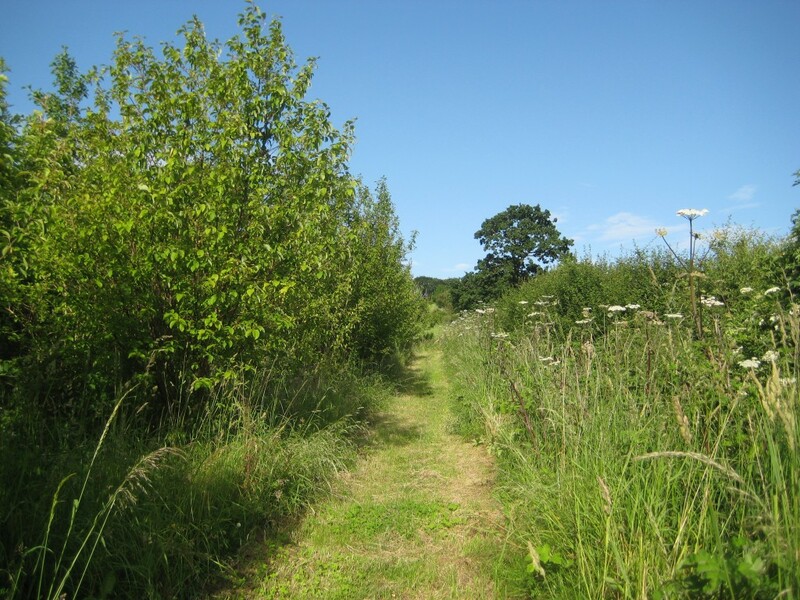 There are mown footpaths and in the Spring, when the trees are in full leaf, it is extremely attractive and full of wildlife, particularly birds and butterflies. The land was purchased by Tim and his late wife Eileen in 2006. Tim and Eileen as members of the Barrow Tree Society had planted many trees all over the parish but they had always planted them on other people’s land. They did not own the trees they planted because the landlord, not the planter, always owns the trees. We thought we must have a plantation of our own and being long in our retirement, we could afford to buy a meadow of 5 acres. A plan was drawn up with the help of the Forestry Commission and planting started in January 2008. Stewart Sim, who is a countryside contractor and lives in Littleton, undertook the planting. The little whips were only one or two years old when they were planted in green shelters. Stewart and his workforce of only three, including himself, planted most of the 3800 trees in just 10 days. In the Spring of the same year village families and children planted a small number of trees in areas left for them. The trees are all deciduous trees of native British pedigree with a separation of 2 metres between them and great care was taken not to plant them in unattractive straight lines. No seedling was tall enough to show through the top of the shelters. The main trees which will now provide the eventual canopy, are oak, ash, lime, sweet chestnut and aspen with many smaller trees and woody shrubs between them. There are birch groves and in wet areas, willows and alder. The field maples, hazels and bird cherries are growing particularly well. Other trees which can be seen are spindles, white beam, rowans, wild service, wayfaring tree, holly, alder buckthorn and dogwood. In Spring lovely pink blossom comes out on the crab apples. Sadly many of the Guelder Rose and some of the Wayfaring Trees have died through insect infestation but hopefully they may recover. Three areas of the wood were left open and are mown by Stewart at the same time as the paths. Stewart also does nearly all the maintenance work. There is a public footpath along the bottom of the wood which runs from Hollowmoor Heath and comes out into Barnhouse lane close to Broomhill. The growth of the trees has been amazing, so great that we have already started to prune and coppice. As you walk through the wood you will see where two of the groups of aspen have been thinned out. We could not leave this thinning any longer as some of the aspens are 35 feet high with girths of 15 inches and if left any longer, they would have been so big that taking them out would cause serious damage to the trees we want to keep. Recently six Black Poplars were planted by the Tree Society in memory of Eileen. We are often asked why the name NABS wood was chosen. We tell the enquirer that our four grand children are Sacha, Nathaniel, Alfie and Roberta so that they can then work it out for themselves. The ordnance survey have readily accepted the name and it will appear on the 1 in 25,000 scale maps when they are next printed. The website administrators have asked me to let them know about further developments in the plantation which people might like to hear about so that the website can be kept up to date. We have quite a few photographs of the plantation from just before it was planted to the present day and Angela Woodcock has been busy taking photographs both last winter and in the current Spring. We hope to select a number of these to go on the website. Of course visitors are free to take their own photographs. Do explore and enjoy the Wood, that is why it was planted. The above article was written by Tim Healey. In the near future, photographs are to be posted on this page and in the website Photo Gallery. 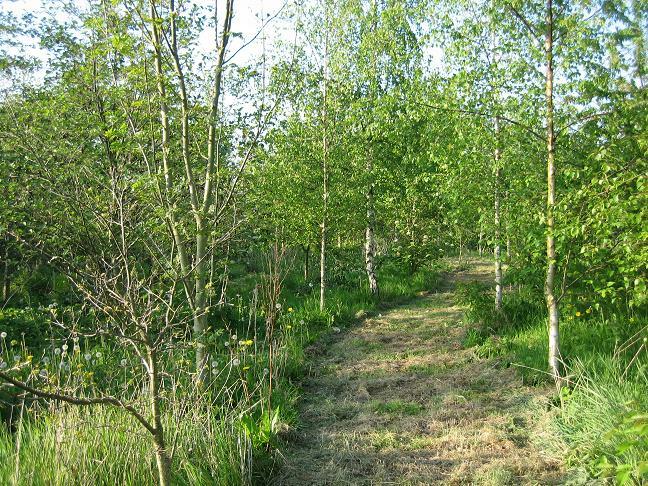 Ferma Wood is a community woodland of 1.3 hectares on the Western flank of Barrow Hill. The land was given to the people of Barrow by Hugo and Geraldine Arnold in June 2010 and is managed by Ferma Wood Trust. From the Western side access is through a small gate on the Right off Ferma Lane which is a public footpath running from Barrow School, Great Barrow to The FoxcoteTea Rooms, Little Barrow. From the Eastern side take Station Lane towards Little Barrow and turn Left opposite The Croft on to a public footpath. This leads through a small gate straight on to a permissive path down the hill to Ferma Wood through two kissing gates. There is a mown path through the wood with a seat. The first planting on the site was in the early 1980s when Vere Arnold of Ardmore (Hugo Arnold’s father) allowed Barrow Tree Society to plant some young trees on a field known as Marl Platt on the northwestern side of the wood. Some twenty years later Hugo approached Tim Healey, then chairman of Barrow Tree Society who submitted a planting plan to the Forestry Commission for grant aid. In the winter of 2004/5 he organised the planting of 1400 trees by members of the Tree Society, Barrow schoolchildren and other interested parishioners. He also organised the follow-up maintenance work. A competition held at Barrow School to name the wood was won by Alex Higgins. As can be seen on the board erected by Paul Haskew Barrow Tree Society won the Cheshire Countryside Award 2005. 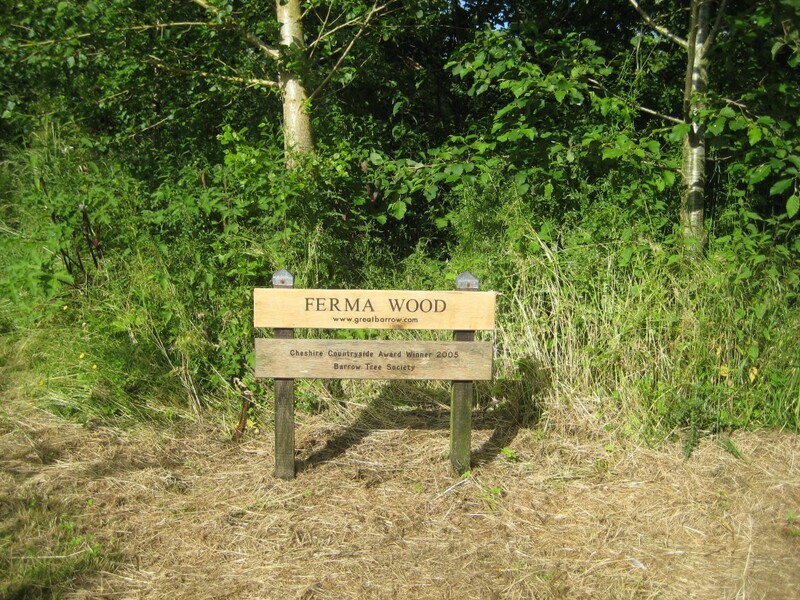 In 2010 Hugo and Geraldine Arnold offered the wood to the residents of Barrow, when Ferma Wood Trust (Barrow) was formed to accept this generous gift. The three trustees are Chris Youngs and Brian and Ann Cavenett. [Shortly after this United Utilities insisted on the removal of certain trees that had been planted over two major pipelines carrying water to Liverpool from the River Dee]. The trustees are grateful for a donation from Tim Healey to cover the cost of the kissing gate at the Eastern entrance to the Wood. Bluebell bulbs of native provenance will be planted in autumn 2012 as Mersey Forest considers this a suitable site. This will be organised by Cheshire Wildlife Trust with local manpower. There are already a very few native bluebells in the older part of the wood. We hope to form Friends of Ferma Wood soon with a minimal subscription, as grant aid has barely six years to run.